I woke up this morning with the sore throat that has been making the rounds in my house. Allergies? Cold? No idea. Then, as I was driving my daughter to another soggy day at camp, I realized I forgot to put my reading glasses in my brief case. Argh! This was not a good start to the day. They say every cloud has a silver lining. And while I haven’t seen anything very shiny in the omnipresent clouds we’ve had this summer, there turned out to be a couple of bright spots to the clouds in my day. 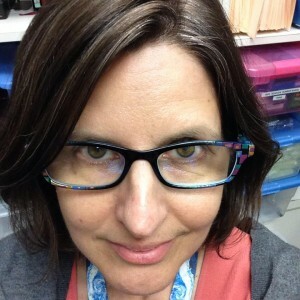 I didn’t have time to get my glasses from home – so I had to get new ones. Had too. Poor me! My forgetfulness got me a whole new look. Off I went to work with my snazzy new glasses. Meeting, rounds, …then found out that my sore throat was going to keep me out of NICU. No seeing babies today! Boooo! I was about to sulk for the rest of the day when things got really adorable. And crafty. 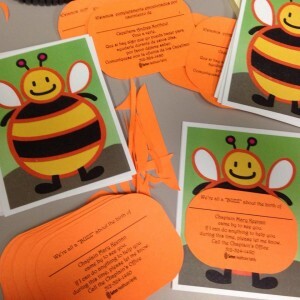 Because I got to spend my afternoon making these buzzy bee cards to leave with NICU families. Silver linings like this will last me (maybe) two days. After that, this sore throat better say adios and let me get back to work.